BSDTalk 246 is available, and has 19 minutes of conversation about TOR, though I haven’t heard it yet to be sure. As you may be able to guess, BSDNow episode 061 has an interview with John-Mark Gurney about updating FreeBSD’s IPSEC setup, along with the normal collection of news items. There’s also a link to a new BSD-switching blog, and “mailing list gold”. Despite my complete lack of good planning, John Marino and Francois Tigeot have packages available for the DragonFly 4.0 release candidate that I assembled. Point at this directory to use them. As Francois Tigeot has pointed out, recent Mesa upgrades have made very old graphics drivers using DRM1 no longer work. They’ve been removed. This won’t affect you unless your graphics card is 10+ years old. If you are running DragonFly, and also using nginx, the so_reuseport option will give you a significant speed boost. I’ve mentioned it before, but not this directly. Your local mirror should have a copy of the release candidate for DragonFly 4.0.0 by now. Please try it out and report problems. Note that this is a x86_64 only version; there’s no i386 version though you may be able to manually build on i386. Lots of light topic links this week. Found via the same link: teletype restoration. Also found: the rotary VoIP phone. I’ve made rotaries work again via ATA, but only for inbound. This, I would love to do. How SimCity came to Unix. It’s available now as Micropolis. Google Summer of Code 2015 has been announced. The great thing about regular expression languages is that there are so many to choose from! Computing is women’s work, in 1967. Why Hypercard had to die. I taught a Hypercard class to older students during college; it was surprisingly easy to get people with no computer experience to build things. I miss the old “computer as tool” approach Apple had back then. Web frameworks from Wal-Mart. Not a sentence I thought I’d type. This week I was on top of the whole linking thing. A Minecraft plugin for FreeNAS. PC-BSD has a YouTube channel. FreeBSD Foundation goes to EuroBSDCon 2014. NYCBUG is looking for meeting space in 2015. The FreeBSD Forums are running new software. A 14 year old IP reference. NetBSD has imported openresolv 3.6.0. Getting snmpwalk to talk to snmpd on FreeBSD. PC-BSD (starts to) gain EFI support. vxlan, virtio console driver, added to FreeBSD. Setting a dedicated serial link on your OpenBSD system. Chromium has some issues in OpenBSD-current in some situations. BSDNow episode 060 bypasses the pun and just commands you to obey. At least, I don’t know the reference if there is one. Anyway, there’s an interview of Olivier Cochard-Labbé of the BSD Router Project, along with the usual array of news. It’s been possible to install and run clang on DragonFly for a long time, of course, and at least build world with it. However, John Marino is putting in significant work to make clang one of the system compilers, replacing the older gcc44 that’s in DragonFly now. (The newer gcc47 stays.) This won’t be part of the next release, but it should be available soon after. I noted the last few things that should be committed before the DragonFly release. People have spoken up for most of them, but it wouldn’t hurt to try recent -master with the upmap/kpmap work that recently went in. Benchmarks wouldn’t be a bad idea, either. Sascha Wildner brought in led(4) from FreeBSD. It’s a driver for flashing LEDs, as you might have guessed. I’d like to see someone make Blinkenlights, whether BeBox-style or just generally mysterious. Writing this now, and hoping I’ll get the server apart and back together fast enough nobody notices. BlackBerry: The Endgame. Points out that QNX is/was a problem for the ecosystem. Breaking Madden: Edge of Tom-morrow. I love these despite being indifferent to football. Measure your open source community’s age to keep it healthy. How tilde.club came together. There’s a potential tilde.club on every BSD machine. My Philosophy on Alerting. (via) Linking for myself at some point. The machine this site runs on just had a fan die, so somewhere in the next 24 hours, I’m going to be installing a new fan, and a new hard drive while I’m at it. Expect a few hours of downtime as I rebuild both hardware and software. Matthew Dillon has added /dev/upmap and /dev/kpmap to DragonFly in two commits. (er, three.) It’s an optimization of some sort, and it is unfortunately over my head. Please, someone comment in a way that fills it in. I’m tired. Because I missed last week, there’s two BSDNow episodes to catch (assuming you are using me as notification for new ones.) Episode 58, Behind the Masq, has an interview with Matt Ranney and George Kolaand, and a tutorial that includes DNSMasq, for the title source. Episode 59, the title of which I can’t reprint accurately, has an interview with Hiroki Sato and the usual number of articles. 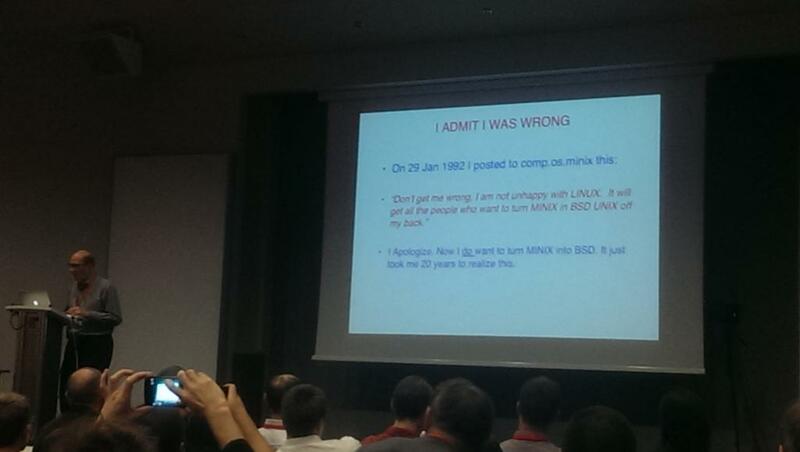 Francois Tigeot gave talks at EuroBSDCon and XDC 2014, and he’s posted slide and video links. He covers DragonFly and Postgres and video drivers, or at least I assume so cause I haven’t watched them yet. There’s other BSD-specific material available too, according to his post. John Marino updated wpa_supplicant (in dports). He then suggested moving it out of base into dports, so that it could be updated independently of the base system. (this update, for instance, took years.) Since wpa_supplicant is necessary to get some systems online – and it can’t be installed if missing if you don’t have a network link – it may be too risky. I think other packages could be moved out, myself. Robin Hahling volunteered to update OpenSSH in DragonFly, which is good news. It’s a jump from version 6.1 to 6.7, so there’s some feature changes. tcpwrappers support is gone, for instance. If you have a reason to object to this change, speak up now.